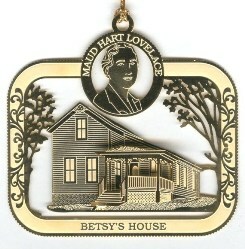 This classically inspired ornament features author Maud Hart Lovelace and her childhood home, “Betsy’s House”. The ornament measures 2 ½” by 2 ¾”, is made of brass and finished in elegant 24 karat gold. 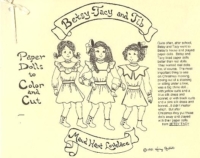 Makes a nice keepsake gift of Betsy’s House, designated a National Literary Landmark in 2010. Gift boxed with origin card. This is the first in a series of Betsy-Tacy ornaments.